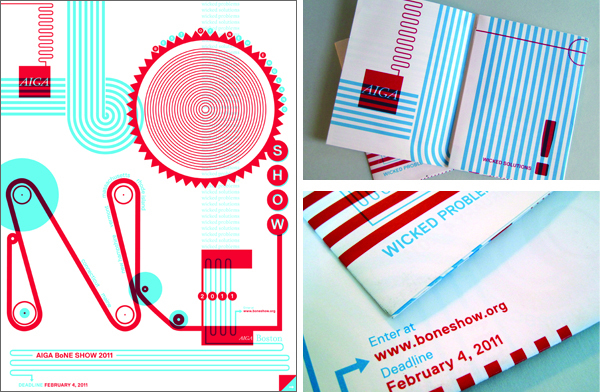 The AIGA BoNE Show (Best of New England [Design]) is a design competition for New England, hosted biennially by AIGA Boston. 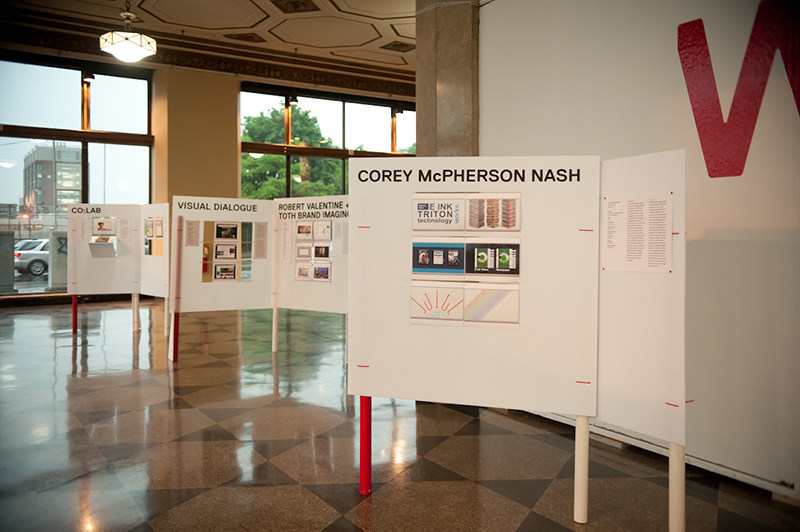 I was asked to be director of the 2011 show—after doing a decent job of designing the exhibit for the 2009 show—and when I said “yes” without even thinking about it, I found myself responsible for its call-for-entries, judging, meet-the-judges event, awards show, exhibition, website, catalogue…you know, every little thing involved with a design competition. It was also the very last thing I did before I left Boston for DC…back in June. Yeah, it’s been a while. First I had to find a theme…. I worked with George Restrepo to brainstorm a half dozen promising directions. The eventual winner—”Wicked Problems/Wicked Solutions”—was born while myself, George, and a couple other AIGA volunteers on the BoNE committee were discussing the concept of wicked problems and how design is essential to problem solving. Keeping tongue in cheek, I also liked that if people didn’t exactly understand our intent for the theme, it could also be interpreted as “wicked” in the New England sense. 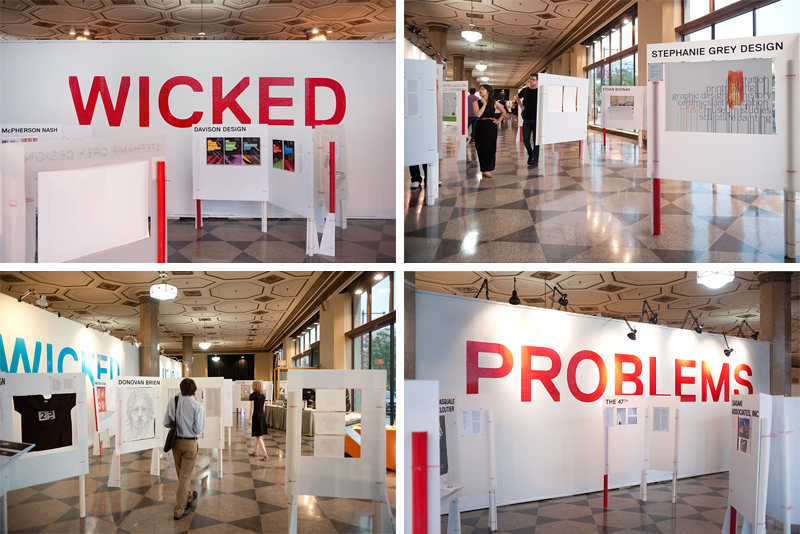 The call-for-entries (above), designed by Kristen Coogan, featured a playful Rube Goldberg-esque problem-solving machine. The visual identity was carried through the rest of the competition and awards show’s graphic pieces, including the website (below), designed by Justin Hattingh, with online entry system put together by Jeremy Perkins—all-around make-everything-on-the-internet-work guy. All event and exhibition photos by Ben Gebo, with thanks. For the exhibition, we continued to play with the problem solving theme. Katelyn Mayfield designed a component-based display system: individual displays could be arranged in any configuration to take advantage of our huge gallery space on Boston University’s campus. The displays could then be packed flat and shipped to other venues when the BoNE Show “went on the road” after its run in Boston. And some details… Designers’ names were laser cut from thick illustration board and the edges of shelves were finished with cyan-colored tape. Below, left: I commissioned furniture designer Seth Wiseman of ConForm Lab to design and build two sets of “tangram benches” which could be moved into endless configurations—a human-sized three-dimensional tangram game. 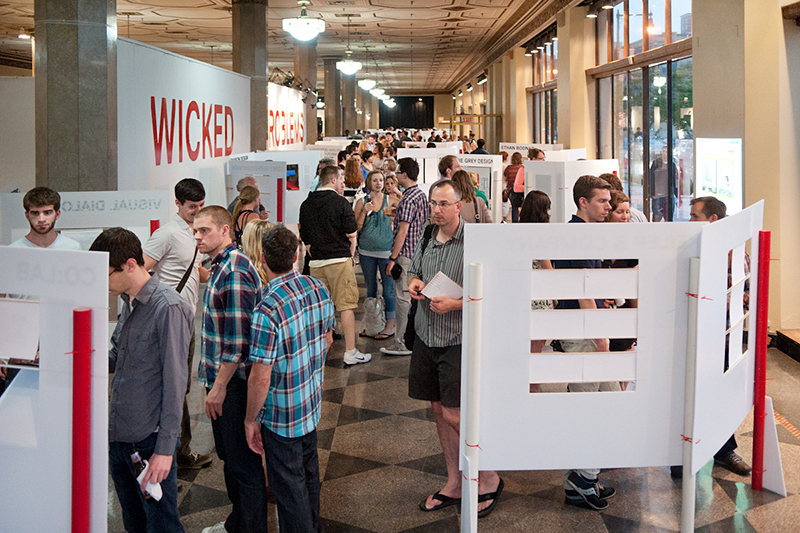 The benches were sold during the event auction and the money benefited AIGA Boston. Seth also designed and built the tangram stage, which is in a couple of photos below. 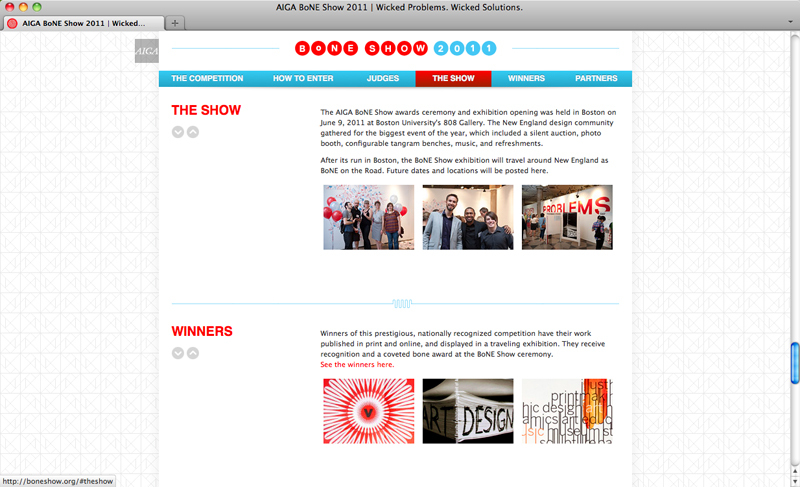 Below, right: For the media-based winning entries, we created a simple kiosk with a great interface designed by Joe Morris. 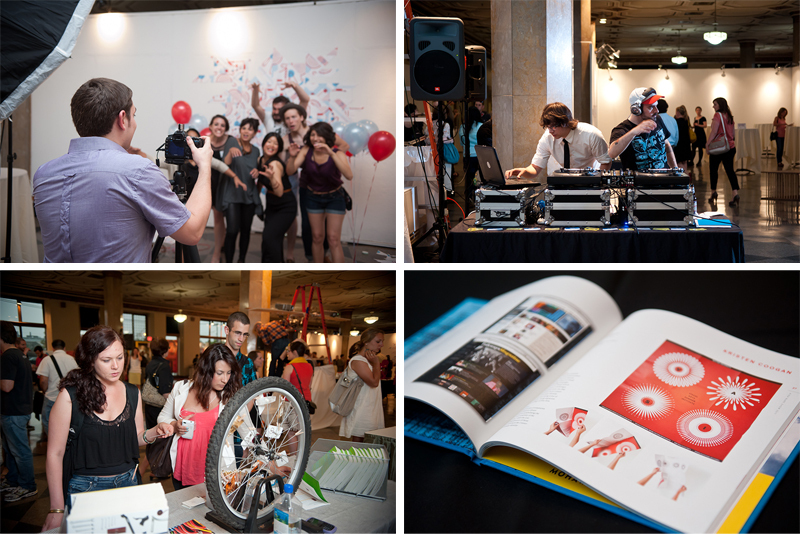 Below, left: Dan Watkins manning the “photo booth.” He also shot all the photography for the show’s catalogue. Below, right: DJs Dan Riti & Kevin James in their sophomore BoNE Show appearance. Above, left: The silent auction table. We also had a live auction for the big-ticket items. Go big or go home… Jason Stevens was my sponsors man, along with Kathleen Byrnes. Because the point of this entire production was to raise money for the non-profit AIGA, we tried to get everything for free, or at least on the cheap, and were very thankful for all of our generous sponsors. Above: The (ahem, award-winning) awards show catalogue designed by George Restrepo and printed and bound by ACME Bookbinding, and the keepsake entry ticket designed by Ira Cummings and printed and foil stamped by EM Letterpress. Below: The awards show! 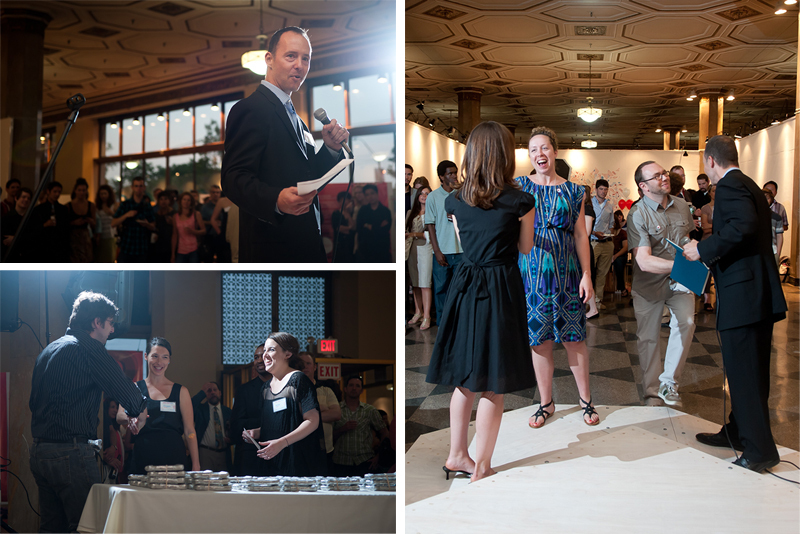 AIGA Boston chapter president Matthew Bacon served as Master of Ceremonies. 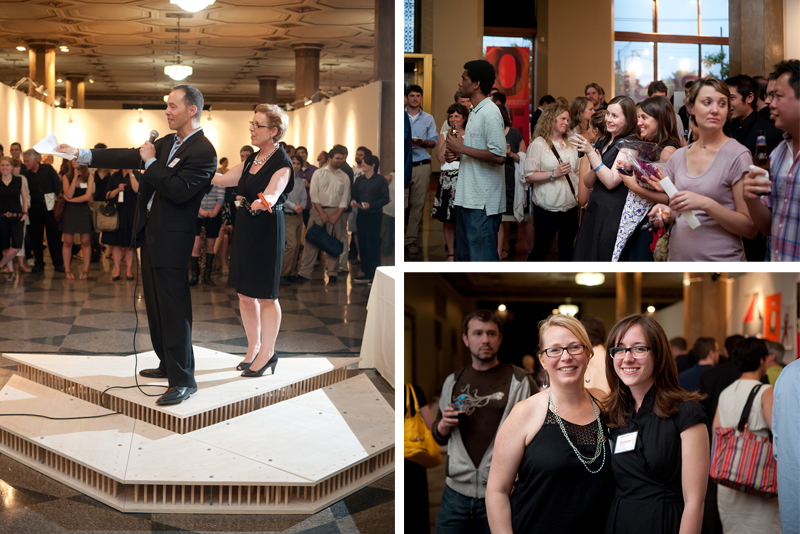 Above left: BoNE Show volunteers hand out bone trophies, cast in aluminum (or bronze for the Judges’ Choice winners). Those things are for real—they weigh a ton and all winners’ names were punched by hand (by Bridget Sandison, who also—along with Juliana Press and Meghann Hickson—took care of receiving and sorting and tracking all the competition entries). Above right: Me and Tracy Swyst, AIGA Boston’s VP of operation, who has overseen many many many BoNE Shows. 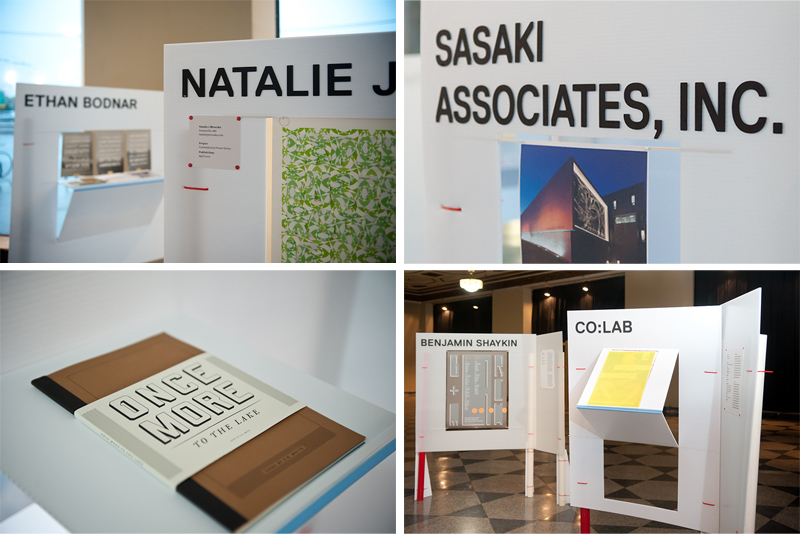 Other people I’d like to thank: the rest of the AIGA Boston board: Heather, Jodi, Colleen, Brandon, Jillfrancis, Diane, Chiranit, Lee, Mat, Jason R, and Sarah, and the boards from AIGA Connecticut, Rhode Island, Maine, and NH/VT, and everyone else who lent a hand in any way. Wow, lots of work, very impressive! This all came together really nicely Christine. It was a pleasure to work with you on it. 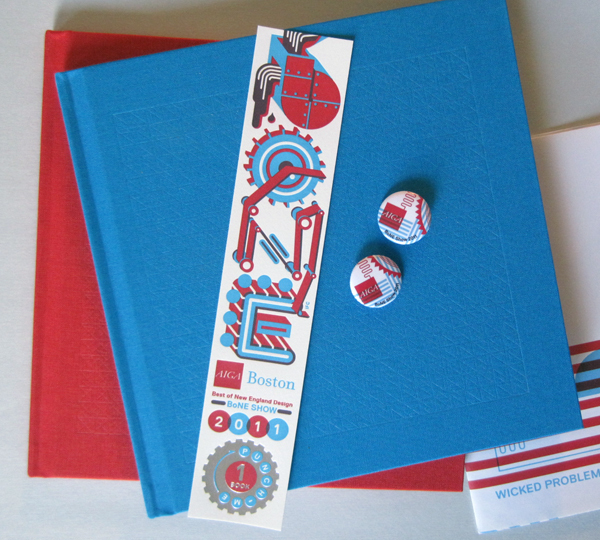 Thanks for the props with the bookmark/ticket.